Continuing west along I-10 from the Escapee RV park I passed through Buckeye, AZ where I stopped to workout at an Anytime Fitness franchise and grocery shopped, restocking the Tank. Buckeye is the westernmost suburb of Phoenix and appeared to be a very nice-sized city of about 56,000 people. 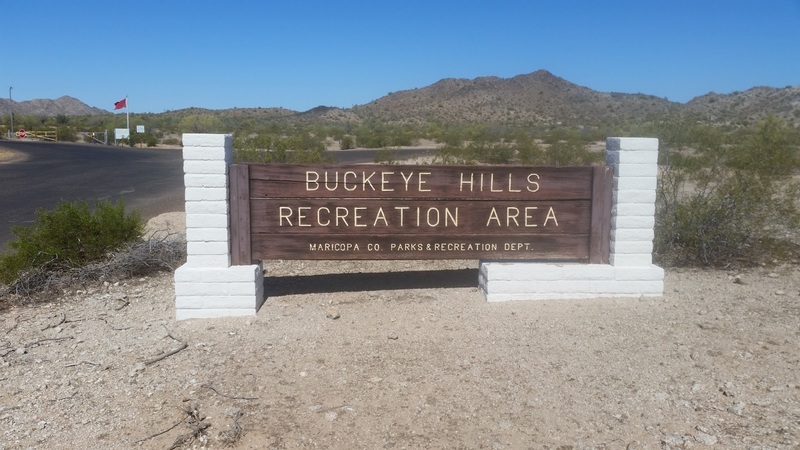 About seven miles southwest of Buckeye lies the Buckeye Hills Recreation Area which is administered by Maricopa County and where you are allowed to camp for up to fourteen days free. The Sheriff Dept. shooting range is down the road to the left. Warning: if you use Google Maps to get to the rec area it takes you to the Maricopa County Sheriff Department's shooting range rather than into the camping area. When Google tells you to turn left after you pass the above sign ignore it and continue straight for about two more miles. I'm sure the Sheriff Department personnel were wondering about why a pickup camper was driving in circles in their parking lot until the driver got his bearings. As you can tell from the lack of amenities in the data sheet camping at Buckeye Hills is your basic boondock experience. The more choice camping sites are fairly distant from the day-use picnic area so plan on packing out your trash. 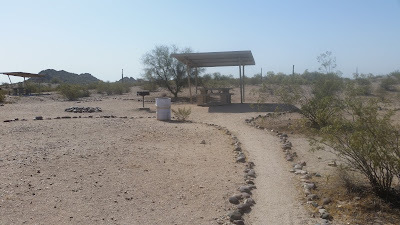 A covered picnic table in the day-use area. My only real knock against the camping experience at Buckeye Hills was the lack of hiking trails. 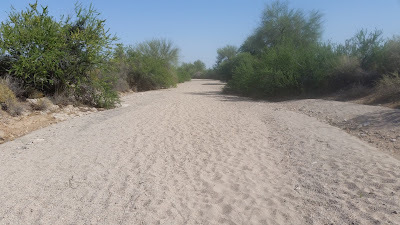 You could easily walk through the desert-like terrain on your own "trail" but I was unable to find a single pre-marked trail anywhere in the area. "And a story is told of a river that flowed made me sad to think it was dead." The sunrises in the desert were really nice. My campsite was about a mile from the day-use picnic area. 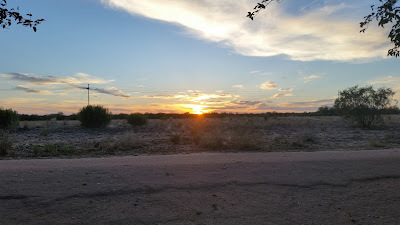 The weather was uniformly perfect during my seven day stay at Buckeye Hills, days in the low-80's and mid-50's at night with strong breezes in the day. I would imagine sometime in May the temperatures get high enough that camping at Buckeye Hills in June to September would get somewhat uncomfortable during the day. Surprisingly, considering it's proximity to the Phoenix metro area the rec area wasn't at all crowded with plenty of sites available even on the weekend I stayed. The picnic area got some use then but even it wasn't full on the weekend and was deserted during weekdays. 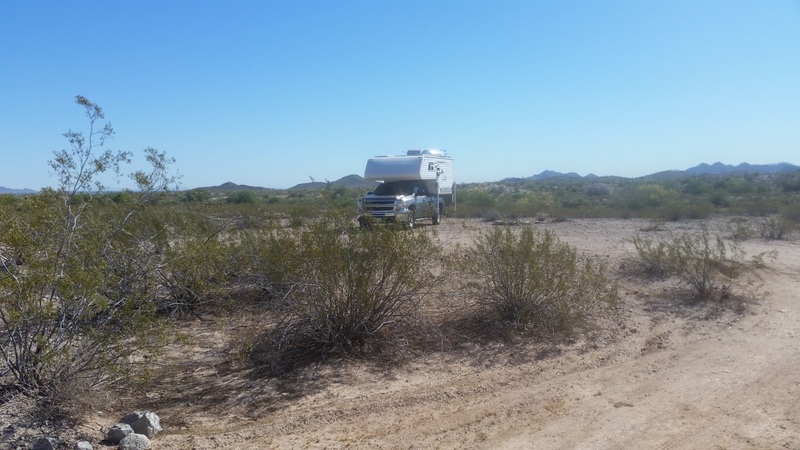 If you like off the grid boondocking check out Buckeye Hills Recreation Area in mid-April, the weather is ideal then.